Italian astronomer Galileo announced with this anagram sent to his patron astronomer Johannes Kepler on July 30, 1610, that (unscrambling his anagram), “ALTIS-SIMUM PLANETAM TERGEMINUM OBSERVAVI.” Roughly interpreted out of the Latin, Galileo was telling his colleague, “I have observed that the most distant of planets has a triple form.” (Note that U and V are interchangeable in Latin.) Of course, Kepler did not understand what Galileo was announcing until Galileo himself later unscrambled the anagram. This was a practice used by early astronomers to lay claim to a new discovery without divulging its nature until the results were ready for publication. 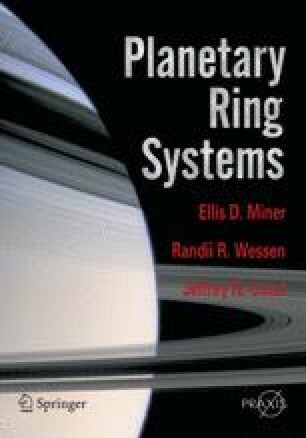 Galileo had been the first to observe the rings of Saturn, although their basic particulate nature (Figure 1.1) was not recognized until the middle of the 19th Century.